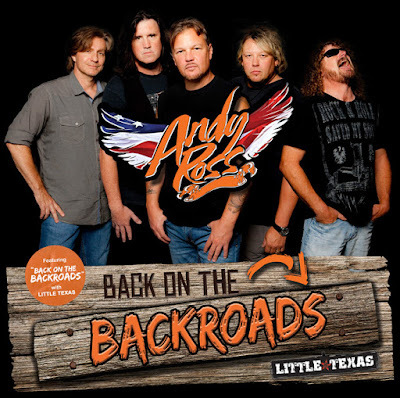 Lovin' Lyrics Music Promotions: ANDY ROSS AND LITTLE TEXAS ARE "BACK ON THE BACKROADS"
ANDY ROSS AND LITTLE TEXAS ARE "BACK ON THE BACKROADS"
Got this one in my email today from PlayMPE. Glad to see these guys headed back to country radio. The CD was released back in January but the single hit country radio's email today. Y'all get to requesting! Country needs more Andy Ross and Little Texas! CLICK HERE TO LISTEN TO ENTIRE CD "TIME TO FIGHT"
Andy Ross and Little Texas founding members Porter Howell and Brady Seals joined forces to write “Back on the Backroads” to help explain why they like to get out off the beaten path and down the road less traveled. Porter Howell has been a long-time collaborator with Andy Ross, co-writing previous singles “Cold Dead Hand” and “What We Do For Fun Around Here.” Featuring Little Texas on the recording was a natural extension of their often sharing the stage throughout the summer touring season. "Back on the Backroads" is from Ross' recently-released third CD, "Time To Fight". Andy Ross is best known as the host of Maximum Archery-TV and American Rebel-TV, where he has been an outdoor television staple and a must-see fan favorite for more than twelve years. The title track from his second CD, "Cold Dead Hand," has served as Ross’ rallying cry to American Patriots about the importance of protecting our Constitutional right to bear arms. The video for "Cold Dead Head" received significant country airplay and the video has generated more than 129,000 YouTube views.